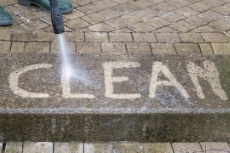 The pressure washer cleaning service from PestControl.co.uk is a great way to get the exterior of your property back to looking its best. Cleaning outside can be difficult, you can't exactly take a vacuum or a mop to a driveway! What's more, the dirt that does accumulate can be hard to dislodge. That is why pressure washer cleaning is ideal for cleaning exteriors. At PestControl.co.uk, our operatives are fully trained in using professional jet wash equipment which will clean just about any exterior. The water which is sprayed out of the nozzle comes out at a very high pressure, which separates dirt from the surface it is used against. Due to the high pressure involved, it can be dangerous however, which is why it is best to use professionals such as the ones from PestControl.co.uk to carry out the cleaning. Gardens. The best way to clean patios and garden furniture is with a high pressure device. It is both fast and effective. Basements. It is easy for basements to become grimy, and difficult to clean them in the normal way. However the pressure washer system cleans brickwork and concrete easily. Walls. If you want the exterior walls of your house to be cleaned, before they are painted perhaps, this can be performed easily using this technique. Driveways. Just about any driveway can be cleaned with the pressure washer technique. This is not a complete list of course, so please get in touch if you would like to make use of our domestic pressure washer cleaning service. Car Park Cleaning. Make your car park look clean and tidy again with a pressure washer service. Forecourt Cleaning. Make a good first impression with a clean forecourt. Chewing Gum Removal. Bits of chewing gum outside your premises can create a negative impression for potential customers, which could make them carry on walking rather than coming inside. Our chewing gum removal service will make the exterior of your property more inviting. Graffiti Removal. Our pressure washer cleaning service can dislodge paint from surfaces, making it ideal to get rid of unsightly graffiti from your property. These are just a few of the ways that our pressure washer cleaning service can be used so whatever you require it for, please get in touch.